Priced to Sell; move-in ready waterfront residence with 50' of no bank waterfront and large newer dock. Soaring ceilings walls of glass to enjoy dreamy lake & mtn views. Gourmet kitchen…Viking appliances, mahogany cabinetry & slab granite. Casual & formal dining venues. Ring in the day with stellar sun rises. Sumptuous master suite with f/p & remodeled 5 pc spa bath. Huge lakefront patio for outdoor living! Great Bellevue schools, easy access to I-90 & 520. The ultimate holiday gift awaits! Lot Size: 0.19 Acres / 8403 Sq. Ft. Directions:from Northrup, drive East until it terminates at W Lake Sammamish Pkwy. Drive South. See yard arm & sign at the entrance of the Bass Cove. Drive down hill, sharp left turn and drive to the home. SchoolsClick map icons below to view information for schools near 838 W Lake Sammamish Pkwy SE Bellevue, WA 98008. Bellevue Real Estate at 838 W Lake Sammamish Pkwy Se Bellevue, WA 98008. 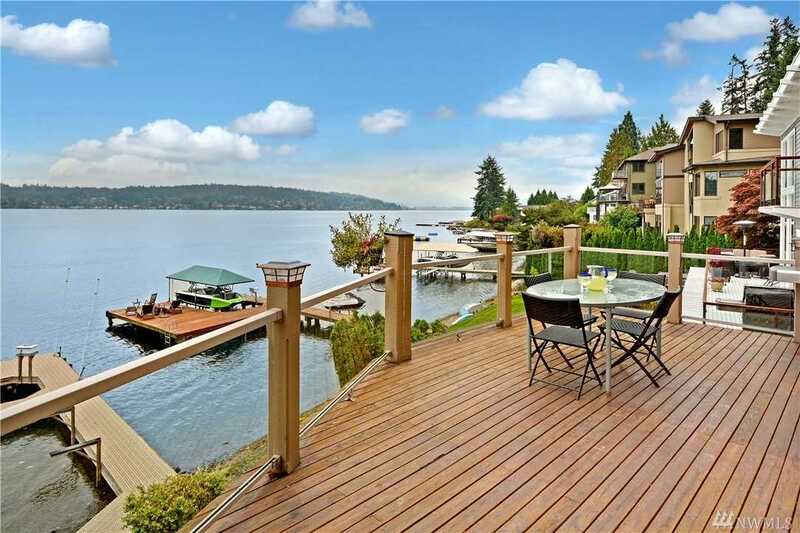 Description: The real estate listing at 838 W Lake Sammamish Pkwy Se Bellevue, WA 98008 with the MLS# 1369660 has been on the Bellevue market for 197 days. This property located in the Lake Sammamish subdivision is currently listed for $2,550,000. You are currently viewing the property details of the NWMLS listing at 838 W Lake Sammamish Pkwy Se Bellevue, WA 98008, which features 4 bedrooms and 4 bathrooms, and has approximately 3400 sq.ft. of living area.